Mantic Games first came to my attention in 2009 as a producer of plastic wargames figures for massed ranked battles. They produced spindly Elves and solid, chunky late armoured dwarves and lots of undead. The next year, the veteran rules-write Alessio Cavatore, produced a light set of rules to use them,rather than choosing to use these as cheap alternatives for another rule system. These have grown from a simple downloard to a printed book and expansions. Wind forward five years and Mantic are due to release an updated version of the rules in August 2015. However, in a bit of cheeky PR, they release downloadable versions of the rulebook and army lists the week after Games Workshop unveiled their “Age of Sigmar” skirmish game replacement for Warhammer. The free rules and army lists are obviously cut down from what will be in the printed rulebook, but there is enough to have a trial game. As usual, this will be a foldable project game using counters. I have converted inches to centimetres for this. For example, a warmachine, with a 50mm x 50mm footprint, or 2 inches by 2 inches, has a counter of 20mm x 20mm. and distances on the field are likewise 1 inch becomes 1 centimetre. Kings of War does not use figure removal to mark damage. 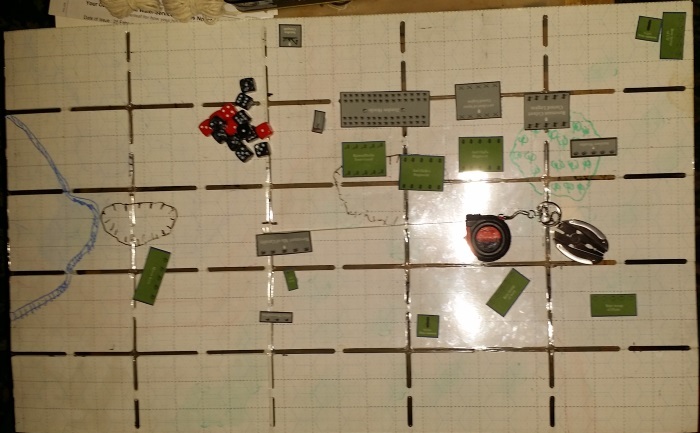 They use wound counters, whether dice or actual markers beside each unit. I decided just to mark the damage on the army sheet. I do have tiny dice that would work (I got them for Warmaster/Blitzkrieg Commander) but I will be playing this over a few nights as I wind down. Units are sized as individuals,war machines, troops, regiments, hordes and legions. Regiments have the same frontage as Troops, but greater depth. The same for Legions compared to Hordes, and both have twice the frontage of a Troop/Regiment. The deeper units get slightly, and I do mean slightly, more attacks than the smaller unit, but more importantly they can soak up more damage. 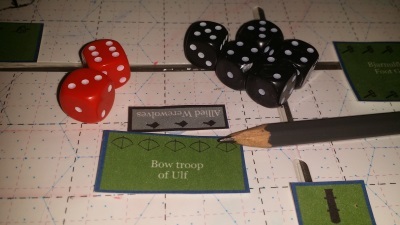 Units in this game will fight on until their morale breaks, and the wounds taken modify the morale check. I drew a couple of hills, a wood and a small stream around the centre line, and did some vaguely random motivation for the deployment. The Noteboard is 10cm too short for the true 48 cmm to match the scale for the board, but I kept the centre “neutral” area true to scale. This made the deployment area slightly narrower than it would be in reality. Army of the North in green, Undead in grey. The Northmen won initiative, and, despite their somewhat defensive deployment, they rolled for aggressive tactics. They advanced the Shieldwalls and Foot Guard at the double, moved the knights to the shelter of the hill on the left, and the missile units went up a standard move. This let the archers fore (at a penalty) The cannons could not, but it gave them a better firing arc for later. The Undead cannot march quickly, as usual in games, but they had to advance as to stay still would to be to invite being shot to death, umm, undeath, err, dissolution. You know what I mean. The Werewolves however have a long movement, and the archers on the left were within charge range (triple movement). That would not only potentially take the archers out, but the Werewolves would be behind the Northmen’s lines, and they would have to react else they would have the Werewolves hitting them from behind. The Archers take four wounds, and the subsequent Nerve test sees them routing off the field. The balefire catapult and the Necromancer’s spells had no effect. The Werewolves, however, slammed into the archers and caused enough damage that y failed the subsequent Nerve test and routed. The North charged into the infantry at the centre of the Undead, but the missile troops find themselves trying to do what they can to defend the rear now that the folly of their impetuousness has been made evident. The Knights pivot ready to charge next turn, but are helpless to do anything else. One set of archers heads left to try and shoot anything it can. The General is forced to attack the Werewolf flank. The cannon has no choice but to fire at the Werewolves. 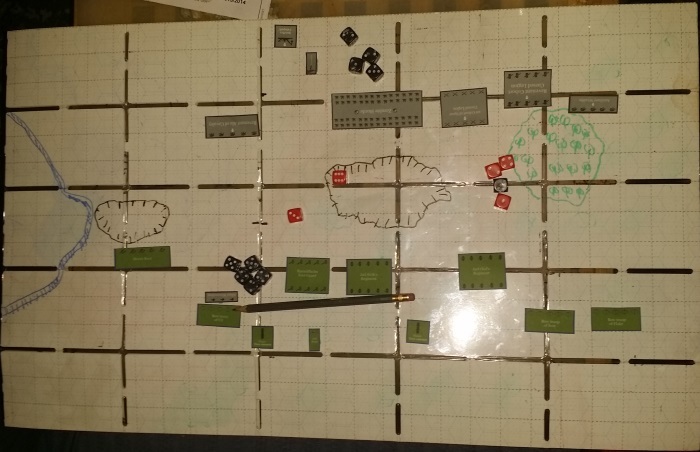 The Werewolves and the Zombies take wounds, but are still in the fight. If a charge does not dismiss your foe then you back off, to ensure an inch, or centimetre in this case, gap between units. Instead of facing the human General, the Werewolves went for the cannon and the Revenant cavalry charged the General. The Zombies charged the foot guard. This is a point that hopefully the printed rules cover. the free version covers multiple units charging smaller units but not larger units charging smaller. The rules about an inch distance between units meant that, there was a bit of shuffling to keep that true. 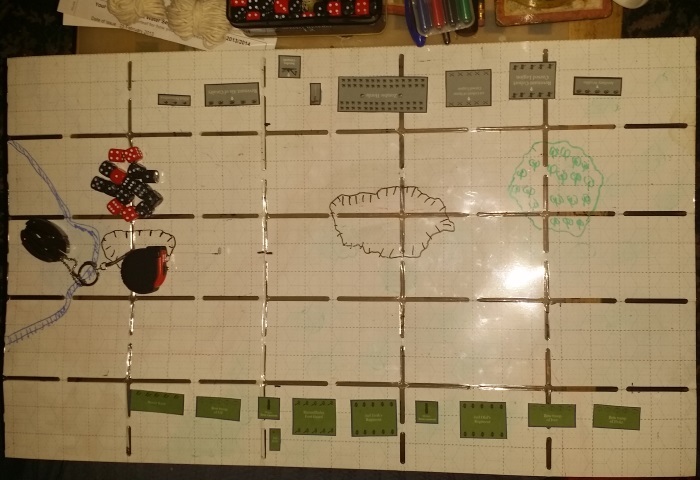 The cannon went, the crew ripped apart by the Werewolves. The General withstood the Revenants and the Knights were wounded by the catapult and the lightning bolt of the Necromancer. Even allowing for checking the rules and deciding random chances for various decisions, this played blisteringly quickly. The resolution of combat flows nicely. Movement, as there is only one turn permitted per move (unless Nimble) has to be planned slightly more carefully than systems that allow for multiple wheels. So far though, this seems to let you plan your tactics and get on with it. There are fewer options and modifiers, but they work well. This was about 25 minutes of time with a hot mug of milk in my hand. Great, looking forward to the next half hour. 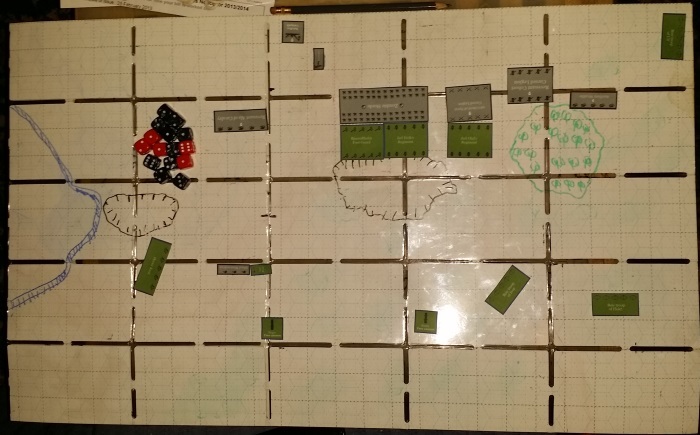 This entry was posted in Foldable Wargaming, Kings of War, Solo Wargaming, Wargaming. Bookmark the permalink. 1) Players also roll the nerve tests on their turn. 2) use an undead horde to slow enemies down then move a unit to the flank and use the movement spell to charge into combat is the undead’s strength. 3) It is blisteringly quick – we never have a game last more than an hour in fact it is designed to be played with a chess clock. OK, strictly speaking you roll your enemy’s Nerve. I’d let the owner do that. Thanks. I’ll check that Nerve check. It might change things slightly. If not a slave to the dice, the humans would have sat back and shot as much as possible. In that case though, the Werewolves would still have noises things up. Has anyone ever done an all-werewolf army? I have. In v1 they were a bit on the overpowered side because Werewolves had 6+ Defense back then. An all-Werewolf army, unless you do some creative counts-as (which I intend to do in the future), is basically an elite light cavalry army. They are 5+ Defense which makes them fragile to anything with Piercing or Crushing Strength. On the other hand, they now have an Inspiring source that can keep up with them in the Lykanis. You have to play what I call wolfpack tactics- try to trick your enemy into exposing a weakness, then double or even triple-team the unit and wipe it out. If you go toe-to-toe with a more numerous enemy they will win. Even Ogres (who are normally outnumbered) will win a slugfest with an all-Wolf army. That said, an army where every unit has an 18″ threat range with an extra pivot can be scary in the right hands. You can go from backfield to flank threat in a single move. One key concept in Kings of War is the ability to use chess clocks. As such you NEVER touch the dice in your opponents turn. (This also means you ALWAYS want to roll high). So Nerve checks are done against the units you damaged – where you want to roll high to rout them.